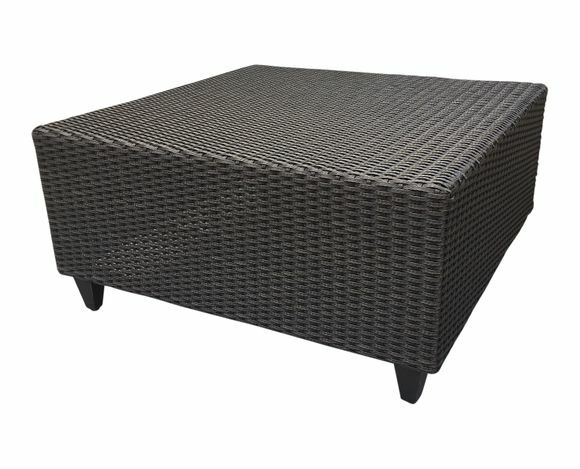 Laneventure the top of the line in outdoor wicker furniture is the manufacturer of the La Joya coffee table. Made of triple stranded synthetic wicker on an aluminum frame the La Joya coffee table is finished in a deep espresso color and features faux wood feet. Ideal for children and windy areas the end table has a hidden plastic lining under the woven wicker top that provides a level surface without a glass top. Covered by a 5 year manufacturers warantee.